Home Local News Motorworld Hosts The Annual Christmas Car Show This Saturday, December 8. The Motorworld, Caribbean Auto and Audi Annual Christmas Car Show is highly-anticipated as the biggest and best Car Show in the region, with some of the most amazing deals and discounts. Christmas will be in full effect in Colebay with the Car Show on this Saturday, December 8 from 8:00 AM – 6:00 PM. 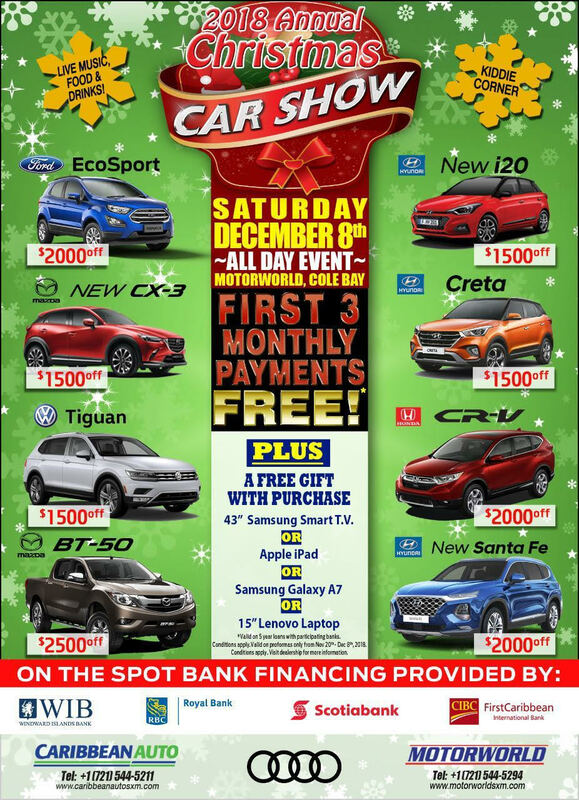 This major event brings fun festivities, good times and cheer for the holiday season, along with some remarkable deals on all the reliable quality brands, which include: Audi, Ford, Hyundai, Volkswagen, Mazda, Jeep, Honda, and Isuzu; along with several All New 2019 models. “It brings us great joy to see people driving away in that new vehicle of their choice. Therefore, we encourage everyone to come prepared and bring along the necessary paperwork in order to take advantage of the finance packages that the banks will be making available on-the-spot at the Christmas Car Show. Several banks will be offering their best rates on this day only,” says Amjad. The Annual Christmas Car Show on Saturday, December 8th is a day not to be missed in St. Maarten/ St. Martin. Motorworld, Caribbean Auto and Audi’s wide range of vehicles, products, and services are listed among the top class dealerships in the Caribbean, with award-winning models worldwide. It will all be available, accessible and ready to serve each customer’s unique needs.